Supercapacitor Balancing Kit suits validation and prototyping. Complementing KEMET S301 Supercapacitor, Supercapacitor Development Balancing Kit includes 2-stage active balancing circuit to ensure that voltage across each supercapacitor cell is approximately equal. Kit features high frequency capacitance retention, energy deliver capabilities, overvoltage protection, and RoHS compliance. Each contains enough balancing cards, bus bars, screws, washers, and wire to assemble six S301 60 mm diameter cells. GREENVILLE, S.C., -- KEMET Corporation (NYSE: KEM), a leading global supplier of electronic components, today announced the release of its Supercapacitor Development Balancing Kit. This kit complements the KEMET S301 Supercapacitor and includes a 2-stage active balancing circuit to ensure that voltage across each Supercapacitor cell is approximately equal. Typical applications include product validation, prototyping, low volume production and custom configurations in a variety of markets. The kit features high frequency capacitance retention, energy delivery capabilities and reliability, as well as overvoltage protection and RoHS compliance. Each kit contains enough balancing cards, bus bars, screws, washers and wire to assemble six S301 60 mm diameter cells. 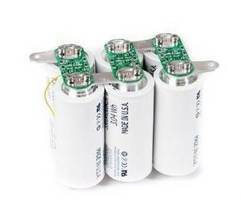 For more information, please visit www.KEMET.com/Supercapacitors.